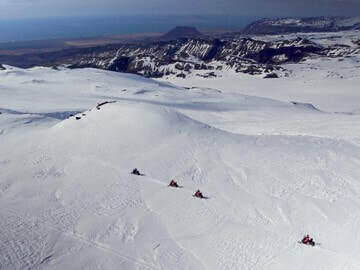 This super-exciting snowmobile adventure takes you to the top of the spectacular Mýrdalsjökull glacier. We pick you up from your accommodation in Reykjavík. From there we head along the South coast to the Arcanum base. At the base we gear you up, go over the safety issues and get you ready for the snowmobiling. The transfer from the base, in a super-truck, takes you up the mountain, to the where the snowmobiles are located. Weather permitting, the ride will give you a breathtaking view of South Iceland, one of the most scenic areas in the country. Everything you need is provided for on this journey and snowmobiling experience is not required. Mýrdalsjökull is the southernmost glacier in Iceland and underneath the 250m thick ice lies the caldera of the volcano Katla. On the return drive to Reykjavík we make a stop by the picturesque waterfalls Skógafoss and Seljalandsfoss. Duration: Total two hours. 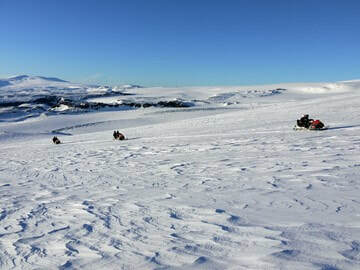 One-hour guided snowmobile tour. Super-truck return transportation from main base up to the snowmobile location, about one hour. A valid driver's licence is required for driving the ATV. ​This tour is not recommended for children under the age of 5. One child only per paying adult. CANCELLATION CHARGES: Cancellation received more than 24 hours prior to departure are fully refunded. Cancellation received less than 24 hours prior to departure will be charged full price. 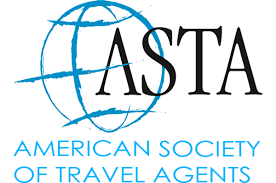 INSURANCE:​ We advise all our clients to have travel insurance. We reserve the right to change the itinerary and the mode of transport or cancel the tour, according to weather or road conditions, or circumstances beyond our control. Please note that the duration of the tours may vary according to weather and road conditions.